ination of D14's body. He was healthy and butterball fat. There were no signs of wear from the transmitter or backpack. How common is electrocution? A federal study done in the 1990s identified impact injuries, poisoning, gunshot, and electrocution as the top four sources of bald eagle mortality. We haven't seen it in Decorah until this year, but D14's transmitter was the only reason we were able to follow him after he left the nest. New poles commonly have bird safety devices since bird electrocutions are not only tragic, but can cause fires and power supply disruptions. However, many old poles remain and safety devices don't always work. It's been known since the 1920s that power lines and poles can present a danger to birds. 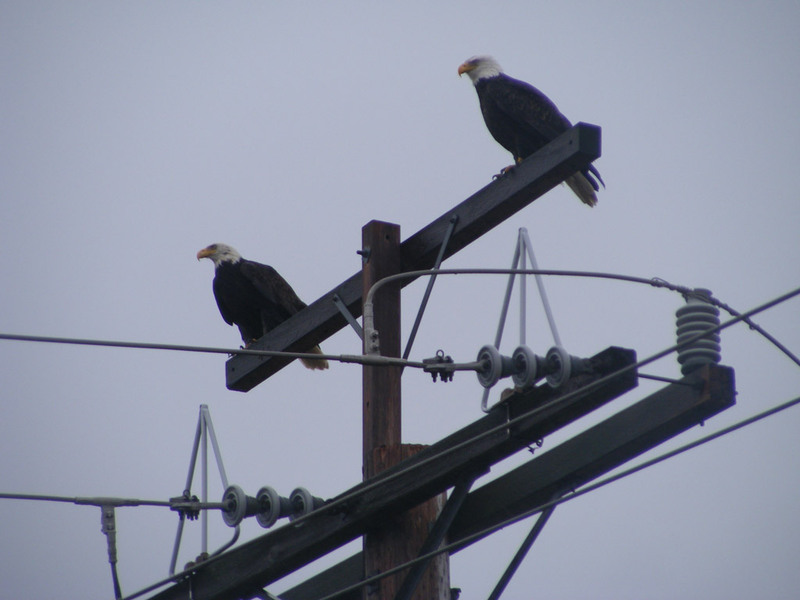 As Bald eagle (and presumably other large bird) populations expand, more electrocutions may happen. D12, a sibling of D14, was electrocuted earlier this year. A group calling themselves The Memorial for D12 Facebook Group (aka The Raptor Nation) responded by working with Alliant Energy, Puget Sound Energy, Decorah High School, and Decorah Building Supply to develop and fit bird-safe perches for the hatchery. I have a blog post and links about that here:http://raptorresource.blogspot.com/2012/11/bird-safe-power-poles.html. All raptors - all wild animals - face myriad dangers in their lives. It is easy to forget that watching and tracking them doesn't protect them. We'll miss following D14. "After the death of Decorah Eaglet D12 by electrocution, D12 Memorial Facebook Group/The Raptor Nation member Ruth Mitchell came up with an idea. Her vision was to build perches to make the electric poles in the hatchery area safer for the Decorah Eagles. Becky Burland agreed to explore the possibility and do the footwork in Decorah. From the beginning, Alliant Energy's Shawna Sailor was very interested in the project. She realized the magnitude of the loss of D12 as the first known tragedy at the DE nest. Shawna and Alliant engineer Dennis Dye worked diligently to learn about perches and Alliant's ability to use them along with their existing equipment. Mel Walters of Puget Sound Energy was instrumental in educating us about perches and how Alliant might design a perch to meet their specifications. Puget Sound Energy is a leader in the industry in making electricity safer for raptors and other wildlife. Mel explained that they have 1000 eagle nests in their area and they are always working to increase safety for the area raptors. Along with perches, they also use bird guards and perching deterrent strategies. We were lucky to have Mel share his experience and knowledge with us. Part of Ruth Mitchell's vision was to have local students build the perches. It was hard to imagine Alliant allowing students to be a part of this specialized collaboration, but Becky talked with John Condon, the Industrial Tech teacher at Decorah High School. He was excited to participate in a project that would help teach students the basics of reading a blueprint and executing its construction. John was also confident that the students could meet Alliant's quality assurance expectations. A previous class made the eagle bike rack that was installed at the hatchery in 2012. Representatives of Alliant Energy, Decorah High School and The Raptor Nation met recently to finalize the Perch Project. Alliant Energy is donating all the hardware and installation labor, Decorah High School students are donating the labor of building twenty perches, and Decorah Building Supply donated 50% of the lumber needed for the perches. John Condon of Decorah High School reports the class will start building the perches sometime between Thanksgiving and Christmas. Alliant will install seven perches on the hatchery poles that Bob Anderson of the Raptor Resource Project identified as most important for protection. They will use the other thirteen perches as popular bird poles are identified." The Raptor Resource Project thanks The Raptor Nation/D12 Memorial Facebook Group, Alliant Energy, Puget Sound Energy, Decorah High School, and Decorah Building Supply for their hard work on behalf of the Decorah Eagles. We'll keep you posted on the installation. Follow the link below for a look at the perch blueprint.